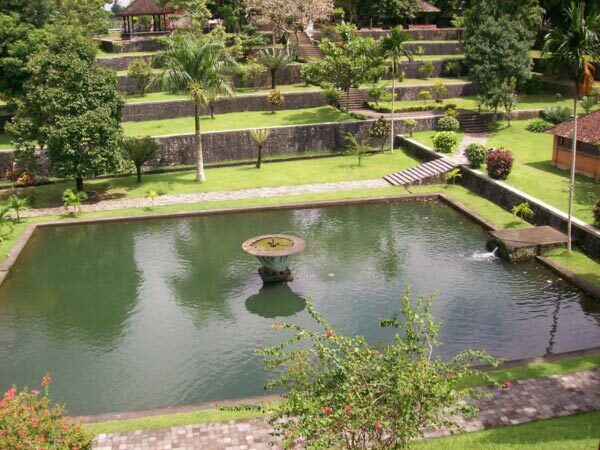 As soon as you step foot into the Narmada Park and Narmada Temple ground, you‘ll instantly feel like you’re standing on the Rinjani mountain, surrounded by trees and a beautiful lake. This holy building stands right in the middle of the Narmada park and the locals call it a “tiny version” of the Rinjani mountain. According to the legends, king Anak Karangasem, the last independent leader of the island, had this temple built because he was simply too old to climb the harsh Rinjani mountain to pray. So, without giving it much thought, the man told his men to build a temple for him in the park in 1727. Since then, Narmada Park and Narmada Temple have turned into big symbols of true faith and dedication. You’ve probably already seen the wonderful yard called Jabbal Kap. It’s the entrance to the park and comes with beautiful twin pools surrounded by mangosteen trees – another exotic touch for the foreigners. The next yard, known as Mukedas, is also a sight for sore eyes. There, you’ll find Bale Loji (it used to be Anak’s resting place) and Bale Terang (back in the day, it served as a warehouse). To reach the famous Padmawangi pool in Narmada Park you’ll need to use the stairs. The picturesque fountain in the middle of it instantly grabs one’s attention and creates just the right atmosphere for the tourists. In the north side of the pool, you’ll find another tiny building – Bale Petirtaan. Yes, I know that all these exotic names in Narmada Park are pretty hard to remember, let alone pronounce, but you’ll get used to it all in no time J. On the east side of the enchanting fountain, the stairs will take you to the Kalasa temple. It’s worth mentioning that Kalasa derives from the name of a sacred river in India and literally means the house of Ciwa, a great god. The citizens of Indonesia visit this place to worship the god and to ask for favors. As the locals say, if this divine figure doesn’t mean anything to you, it would be best not to disturb it with your “silly questions”. This temple is a bit unusual in that it’s got only two yards as opposed to the regular three. In the outermost yard, two Bale gongs welcome the tourists. As for the inside yard, it’s covered in beautiful red bricks. And, there are 3 Sanggah and they stand as symbols of trinity in Hindu (it’s a very important part of the religion). You can enter this yard both from the west and the south. So, yes, there’s plenty to see and touch at Narmada. As always, it’s all about opening your heart and soul to new discoveries and letting these new ideas lift up your spirit. That is why the majority of folks prefer to travel with their loved ones. That way, every single experience becomes more meaningful and strong. Please keep in mind that places like the Kalasa temple aren’t always open for visitors. To enter it, you will have to talk to the caretaker who lives on the north side of the temple. The man will tell you the exact dates when you’ll be able to enjoy Kalasa (usually it’s open during special celebration/praying days). If you’re a bit tired and want to take a minute to relax and enjoy the view, I’d highly recommend visiting a bale gong in the area. Essentially, the locals use this term to describe a beautiful pavilion with traditional Indonesian architecture. From there, you’ll get a breath-taking view of Narmada Park and Narmada Temple. The surrounding areas will also be in your sight. Furthermore, the cold-yet-refreshing water of the local pool will be perfect for folks that sweat a lot and/or simply want a nice boost of energy. For the tourists that are all about that active lifestyle, sailing in this large pool using one of the boats will be a blast. They are all swan-shaped and in order to make them move, you’ll have to row. Believe me: all that swimming and rowing will make you both tired and hungry. Thankfully, the east side of the park is specifically decorated for the fans of resting and having a bite of something tasty. The bright and “appealing” food stalls will give you just the right motivation to keep admiring Narmada Park and Narmada Temple. However, they are located on higher grounds, and you’ll still have to walk for a minute or two to get there. So, what treats can you expect here? Mostly, sate bulayak, which is basically a traditional Indonesian food made from chopped chicken, beef, or fish. Sounds great, huh? Bulayak will also be served (it’s rice cooked in palm leaves) and together, they taste great. Even if you’re not a fan of the local cuisine, all that walking, swimming and everything in between will turn you into a hungry beast J. As you probably already know, the prices in this country are super-affordable. For an average tourist from the EU or the US, the price-tags will be a nice surprise. Ten dollars in Lombok will allow you to catch a ride, have some delicious meals for 4-5 people, and more. Some folks prefer to buy food in the city and take it with them to the temple, but that’s not really a good idea. Besides, all that “huffing and puffing” won’t get you anywhere, not to mention it will, without a doubt, ruin the spirit of a great adventure in a foreign country. So just try to enjoy your trip and spend a bit more for the full experience. Let’s take a closer look at the landmarks of this captivating complex. The so-called fountain of youth is, without a doubt, worth a visit. The wellspring that combines not two, but three water sources – Suranadi, Lingsar, and Narmada – is considered to be sacred by the Hindu people. Their ancestors believed that the waters flowing in this wellspring are magical and can grant youth. Please remember that you’re not allowed to wash your feet in this water – only your face. The majority of tourists prefer to take it with them as a souvenir of some sorts. It will cost money, though. Bale Loji, mentioned above, comes with a warehouse and also deserves a visit. In the living room, the tourists will get a chance to admire the breath-taking view on Meru, the swimming pool, and the gorgeous flowers in the surrounding areas. It is the beauty of both Narmada Park and Narmada Temple that make it one of the most popular and cherished destinations for tourists. The locals also like this complex and frequently visit it from every single corner of Indonesia. Finally, Pura Narmada is the most epic tourist spot. Yes, it’s the temple built by the king, the main attraction of this entire tour. According to the historians, it’s one of the 8 oldest temples on the island. If reconciliation and serenity is what you’re looking for, this place will be a great pick. Pay +/- 5K Rupees and enjoy! The life-changing Narmada temple is located only 12 kilometers away from Mataram. You can use both public transportation and rent a car to get there. It goes without saying that it will be more fun to rent a fancy vehicle to enjoy the trip, especially if you’re not alone on this journey. The Mataram-Cakranegara-Bertais-Narmada route is the best one for this. On a public transport, you won’t have to worry about directions, but hey – a great adventure is always about more than just sitting in a bus and looking sad and lonely! Oh, and by the way, motorcycles are also extremely popular among tourists, as they give you that “wind-in-your-face” experience. The ride will take about 30 minutes. The Lembuak village is a truly inspiring place. It might not look like a million bucks, but there’s something truly magnificent about it. As I said in the beginning, Narmada is a park that was built based on the image of the great Mount Rinjani and is one of the most sacred spots on the entire island. Keep that in mind while visiting it. These days, both Narmada Park and Narmada Temple are officially recognized as important objects of cultural heritage. Naturally, that makes this complex super popular among the Western tourists. During the 1980-1988 period, several renovations took place, and that is why it looks brand-new today. Now, some parts may be a bit “outdated” but the temple still looks great while maintaining its authenticity, which is of the utmost importance when it comes to a religious object of this magnitude. The name of this wonderful place, Narmada, comes from the name of the largest tributary of the Ganges. Quiet, humbling, and totally worth it! The temple looks enormous when you’re actually standing in front of it. The park is beautiful. If cleansing is what you’re looking for, this complex is a safe bet. Thanks for this great article! I had fun reading it and felt like I was back at the place enjoying ancient temples and pools with my loved ones. For the so-called “religious tourists”, both the park and the temple will be simply astonishing. In my humble opinion, you’ll have the best experience if you take the little ones with you on this trip. Nothing feels more natural than learning about other cultures with your entire family. We never had any trouble communicating with the locals and getting to our destination. The riveting atmosphere of this place will steal your heart. Beautiful, meaningful, and full of history – that’s what it’s all about.